On a night filled with separate agendas and a plethora of ways the final three spots could occupied after Richmond, the Chase for the Sprint Cup field has been set. In this year’s field, there are five former champions, six Chase veterans, and one Chase rookie that has been on fire all summer long. Although this Chase field is truthfully one of the most competitive the truth is that there are no favorites. There’s 12 drivers that have had excellent seasons through the first 26 races, and have earned their spot to contend for the title. It’s a championship that is more up in the air than in many year’s past. Considering how the last five championships have been won by the same driver, it is extremely gratifying to know that there is no clear favorite to win the championship heading in. That means that every driver is on equal ground, with the exception of them being seeded based on wins. Already there is a tie at the top between Kyle Busch and Kevin Harvick, two drivers that have experienced their share of run-ins this season, most notably of course at Darlington in May. And don’t look for Kyle Busch to forget what happened at Homestead last year between the two there. Like I said before, this season has been about feuds, redemption and first-time winners. One can not forget about Jeff Gordon, experiencing a great resurgence in his career with three wins, the most he’s experienced in one year since 2007. He’s followed by Matt Kenseth, the last driver to win a championship before the Chase was introduced. After him, it’s four drivers with one win on the year, Carl Edwards, Jimmie Johnson, Kurt Busch and Ryan Newman. The final two spots in the top-10 are Tony Stewart, the last driver to win a Chase title not named Johnson, and finally Dale Earnhardt Jr, who has experienced a very odd season with his new crew chief, Steve Letarte. The final two spots were the wild card entries, as they missed out on the top-10, but earned their way in because of their wins. And just because they are ranked 11th and 12th in the points does not mean count these two drivers out! In 11th is Brad Keselowski, possibly the hottest driver entering the Chase because of the success he had over the summer. He did not finish outside the top-10 since Indianapolis, and earned two more wins to go along with his fuel-mileage gamble victory in Kansas. The final Chase contender was the one that last year had the opportunity to take the championship away from Johnson. Denny Hamlin was the guy last year to possibly end the stranglehold Johnson had on the title, but had it slip away from his grasp in the final race of the season. He enters in last because of his one win at Michigan earlier in the year, but is hopeful that he can make one opportunity and make up for his mistake last year. There we have our Chase Class of 2011! 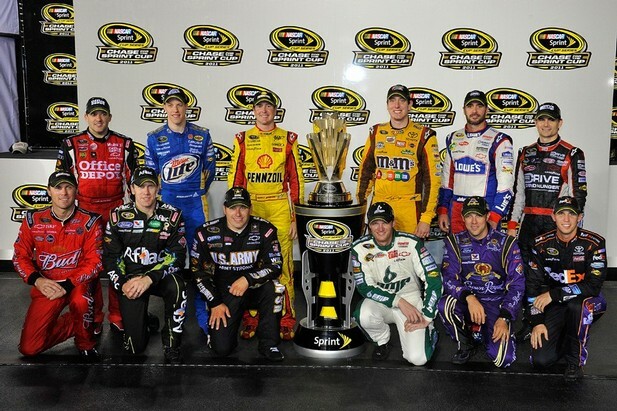 Who will win it all, Which feud will ruin someone’s championship hopes, and will Dale Jr win a race this year? We have 10 high-impact races to find out and stay tune, folks! This is going to be one you don’t want to miss!